Do Mosquitoes Live All Year Round? Having mosquito repellent plants in your garden will help out great when trying to reduce their numbers. A large reduction of mosquitoes in the yard can be achieved with little effort, but only if you know exactly which of the many anti-mosquito plants to choose. There are a lot of articles giving you advice on how to use outdoor plants to repel mosquitoes, but I found very few of them to be useful. I don’t want to make my own spray! I just want some plants that directly repel mosquitoes, that’s all. So I started to do some research myself. This is what I’ve learned. There are a lot of plants with mosquito repellent properties in them, but only few that will directly repel mosquitoes by just planting them outdoors and calling it a day. So I set out on a quest to find the most effective anti-mosquito plants out there. But let’s start at the basics first. Are plants a good tool for repelling insect pests at all? Taking all this effort of transforming the garden has to be worth your while, after all. I decided to put some of them to the test in my own yard. Do Plants Actually Repel Mosquitoes? Plants are an effective remedy for repelling mosquitoes. To repel mosquitoes outdoors, start by planting some scented plants such as lavender or lemongrass. Contrary to popular belief, a Citrosa plant does not help repel mosquitoes effectively. Instead, its actually better to choose herbs like rosemary or basil. Despite the fact that some plants will repel mosquitoes, it will never be as effective as e.g. a professional mosquito magnet (such as this one on Amazon). However, it must be noted that natural solutions are a lot more environmentally friendly to your outdoor area than spraying chemicals. The power of some natural plants is more surprising than one would think. Just having certain species in your garden will help keep blood-sucking pests away. What Is The Best Plant To Keep Mosquitoes Away? The type of plant that is best for keeping mosquitoes away is based on scent: Either horsemint, lavender or marigold will repel mosquitoes effectively. However, a lot of herbs will also be good for using as an anti-mosquito plant. The working components of plants are often found in anti-mosquito spray as well. There isn’t a single plant that is best to keep mosquitoes away, but some plants work great together to fight mosquitoes in your garden. Combining scented plants with herbs (as well as certain small trees) can all be a great choice to grow a variety of different anti-mosquito species outdoors. Having anti-mosquito plants in your yard can also be beneficial in other ways. A lot of these plants can make your garden smell great, while still attracting butterflies, bumblebees and other fun garden species. But there are a lot of different types of outdoor plants that have other uses in the yard. Let’s check out the most common types of plants we can use against those mosquito pests. 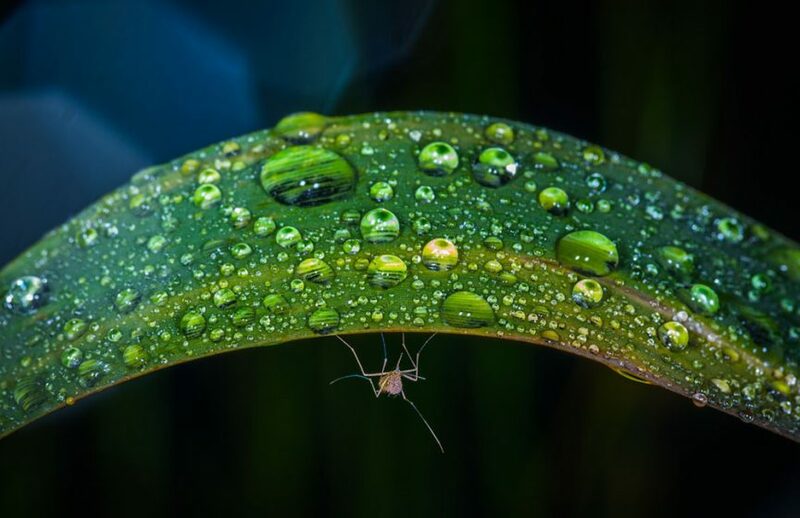 What Types Of Plants Deter Mosquitoes? The classic scented lavender plant will not only make your garden look nice and purple, but it also smells amazing ánd attracts all sorts of good insects. That excludes mosquitoes, which hate the heavy scent coming off of lavender. It’s an easy plant to maintain, all it needs is good soil and some occasional sunshine. It’s fine to plant them in partial shade. The weather will do the rest, just don’t overwater them! While mosquitoes hate it, bees absolutely love to get their honey from lavender flowers. Honey is better for you for a reason, because extracting essential oils from this plant can cure many common health problems. For example, you can easily treat a headache with this natural product, simply by extracting its oils. I love repellents with multiple uses that also look ánd smell great. There is no reason not to get some yourself, because the price is laughable. Another beautiful and highly scented mosquito repellent is marigold. This annual flower not only looks great in your garden, it will also attract all sorts of useful bugs that pollinate other flowerbeds and plants. Butterflies, ladybugs, you name it: They all love marigold. But not mosquitoes, they think the scent is way too strong. They are easy to grow and will also benefit a vegetable garden (due to them protecting your yard from all sorts of pests). In another article, I’ve mentioned already what a great repellent solution this species is. Marigold contains pyrethrum, which is an organic pesticide. Pyrethrum is commonly used as an ingredient in multiple types of anti-insect products. Honestly, I’d recommend you pick some seeds from Amazon using the buttons below, since it’s dirt cheap and very effective. Check out that price on those premium seeds! Another one of those delicious herbs that can fulfill many purposes is lemongrass. Maybe you’ve seen these citronella candles, which are great for outdoor use and will just as effectively repel mosquitoes. However, the oils used in these scented candles are extracted from lemongrass, which is naturally great at warding off these biting pests. What type of scent you can expect from this somewhat boring-looking species is already in the name. Think citrus fruits, but make it sharp and fresh. That’s exactly what you can expect from this species, which also does fine in light shade. It doesn’t need much to grow, which makes it the perfect candidate to try out. Grab your seeds and fully grown specimens using the Amazon buttons below. While we are on the topic of citrus scents, let’s look at horsemint, sometimes also referred to as belonging to the bee balm family of plants. This is an annual and perennial flower that is very adaptable to different types of environments. It doesn’t need much water and can flourish in the (partial) shade just as well as in the sun. It also attracts harmless bees, which is great for your garden. Growing from the seed is very easy, all it takes is some loose topsoil and an even spread of the seeds. If it doesn’t rain, water them periodically when the soil gets too dry. After the plant gets beyond 10-12 inches, additional watering is no longer required. Very simple stuff, can’t get much easier than this! The edible evergreen shrub rosemary is another one with scent-based mosquito deterrent properties. They have needle-like leaves, but will occasionally sprout beautiful blue flowers as well, which you will see in the warmer months of the year. This so-called “mist of the sea” is easy to grow: Sandy soil, a little water occasionally and it will grow in places with plenty of sunlight. Do make sure to pull rosemary plants indoors when it starts to freeze outside, because that’s something they will not survive. Because of this, it’s better to grow them in movable pots, so you’ll be able to move them inside when you need to. If your climate allows for year-round warmer temperatures this won’t be needed. Talking about multi-purpose plants, another delicious herb that works wonders against mosquitoes is basil. Perfect for Italian dishes, this herb will grow best in a climate that is warm. Mediterranean food needs a Mediterranean climate, makes sense right? I love to put my basil in pesto as well, just a quick culinary tip there. Basil is one of the easiest plants you can find to keep alive: It barely needs anything. Only save it from cold weather, is the basic rule (just like with the rosemary). The scent of basil is the thing that keeps mosquitoes away, so just place these plants near your backyard door and enjoy the freedom of fresh herbs and not getting bitten by nasty insects. Let’s go back to beautiful and colorful, because why not combine pretty with practical? Geraniums will repel mosquitoes like no other, they smell nice ánd look nice in your garden. I’ve got plenty of room in my yard to hang up things, so I really prefer the hanging basket variety. Now do make sure to water these flowers a lot (especially if you use that hanging basket), and please note that they are really mostly spring- and summer plants. They flourish in warmer environments, but too hot will make them shrink and die off. If there’s one flower you absolutely need as a natural mosquito repellent, it’s going to be the geranium. This is a bit of a double-edged sword, because while catnip does deter mosquitoes, it will attract all of your neighborhood cats. And they’ll get stoned in your garden as a bonus. So you have to be able to enjoy that before even considering planting this joyful species into your yard. The looks of catnip somewhat resemble stinging nettle, but trust me this species won’t sting you, your cats, or any mosquitoes. Cats will get high in your garden, and change into mosquito-killing zombies! Just kidding. The catnip scent is just something mosquitoes tend to hate. Luckily your furry friends are completely different and absolutely adore it. No, it’s not weed in the image on the right, it’s wormwood! The leaves for each species of wormwood will look quite different, but they are usually greens with small leaves on them. They are also known as mugwort, which comes down to the same family of plants and they all are great mosquito repellents. You’ll be best off growing wormwood in well-drained soil in a sunny location. Wetness is not really it’s thing, so don’t bother watering it extra. Usually, the springtime is best for planting these magical plants, which I personally found to be among the most effective organic solutions to stop insects from coming indoors. Another delicious herb, another highly effective mosquito repellent. I’m talking of course about thyme, one of the healthier herbs out there that goes with a lot of dishes. Especially the lemon thyme variety will have the same effect as some of the other citrus-type species listed in this article. It’s all about the aromas with this little yummy shrub. Pretty hard to grow from seeds, so I recommend choosing the live plant option. It’s a small plant that can take a few hits, so the transportation will most likely be fine. Click here for the full details on how to grow thyme in your garden. It also works great indoors, it is all up to your personal preference. We all know garlic scent works against mosquitoes, but have you ever thought about planting the species outside in your yard? It’s not only going to get rid of those nasty pests for you, but also will ward off any unwanted moles or snakes (if those happen to be living in your area). Please note that it is not the plant itself that will repel a mosquito, but mainly the scent of the edible parts. Recommended by your dentist, the multi-purpose floss flower! Just kidding, but it’s a beautiful bright purple flower with an amazing smell to it. Don’t worry, it has nothing to do with flossing your teeth. Although the Ageratum Houstonianum (also known under the name “Bluemink”) will look like tiny purple floss wires. Eucalyptus plants keep mosquitoes away very effectively, merely by planting one in your garden. The eucalyptus, also known as the anti-mosquito tree, will repel mosquitoes with its scent, which is known to be methol-like. The tree oil extract of eucalyptus is proven to be a good natural alternative to DEET. Really cool as a serial insect killer is the animal-eating pitcher plant. You can also replace it with another similar insect-eating plant, which does the job just as well. This meat-eater will lure and trap prey into its deadly interior. And then it devours them whole, alive! This species will work wonders on all flying pests. This is not a winter plant. The flowers of the snowbrush (Ceanothus velutinus) simply resemble that of snow, once you brush past them. Also, after the flowers let go of the leaves, your garden will look like a snowy landscape. But that’s not what we want when repelling our mosquito friends, because it is the scent of the flower that does it. Another flower that works well against mosquitoes is pennyroyal (Menta Pulegium). This flower from the mint family is a predominantly European herb. Usually, it will flourish only in spring and summer time. It will look great in your yard and make it smell nice too! Also known as dwarf catnip, this species is a little different from the catnip discussed before in this article. Catmint has got a light purple flower and will grow up to 16 inches tall. It requires either full sun or partial sun to be able to grow, but is only a seasonal option. It will usually bloom and flourish in the late summer. It can rebloom in the fall. The working ingredient in cedar is often used in organic bug spray, but it will work just as well if you wish to grow these in your garden. The cedar is usually seen as a natural hedge, because it can get so dense in its growth. You can even use the mulch to discourage mosquitoes from coming near your house. A lovely small flower that’s yellow and white, and it also smells quite nice! The feverfew flower uses its scent to repel mosquitoes away from your house, but welcomes all of those good ones, like bees and butterflies. It’s incredibly easy to grow these, but be aware they don’t spread everywhere too fast. Keep them in a pot or a raised flowerbed. Growing lemon verbena is best done in loose-well drained soil. This lemony-scented flower will do just as well against mosquitoes against lemongrass, for instance. It’s exactly that lemon scent that mosquitoes tend to dislike. This herb will only flourish if you do some proper drainage on it. If you wish to know all the details on how to grow lemon verbena, please check out this useful article. The last one on the list ranks among one of the more effective solutions to ward off that unwanted mosquito. The peppermint plant is one of those herbs that will just scream at insects: AAHH, DON’T GET NEAR ME! And then they will just move out of the way. Okay, maybe not that literally, but the scent is so potent that it works like magic! Get a beautiful mix of mosquito repellents, including Peppermint and Catnip here! Now you’ve familiarized yourself with some of the more effective mosquito repellent plants for the yard, it’s time for you to get to work. Go to your local garden shop and grab some of these amazingly helpful plants! Alternatively, you can use the Amazon links in this article to get them delivered to your doorstep in the next few days. I’ve noticed Amazon can be a great resource for doing some garden plant shopping as well. Personally, I prefer growing my plants from the seed up, but if you want immediate results (and remove some of the plant care), it’s also possible to get the matured plants immediately. Once you’ve chosen your favorites, it’s time to grab your garden tools and start working on your first line of mosquito defense! I explicitly say the first line of defense, because while providing a decent deterrent, these plants will not be a 100% foolproof method for not getting bitten by a mosquito. For this, you’re going to need some heavier duty products. On this category page I made, you’ll find links to the most common anti-mosquito products (as well as bite treatments). All of these are personally tested and reviewed by me, so you’ll know they are going to work magic on those biting pests. Make sure to check those out and have fun planting some new things in your garden!